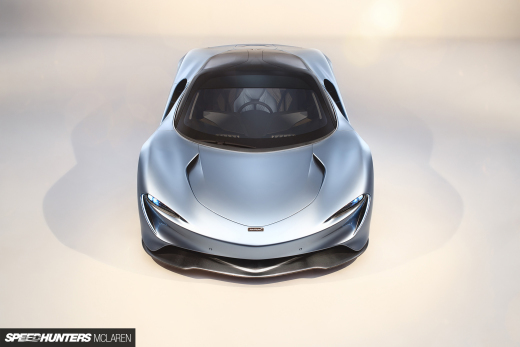 There are many ways to express personal passion for cars. Some people work as engineers, managers and marketers for the world's car companies, others spend their time working and building cars either for themselves or for others, or some like myself are involved with automotive media and spend their time shooting and writing about all things automobile related. There are also some individuals who are in a very rare place in life: they have the means to build up car and memorabilia collections. 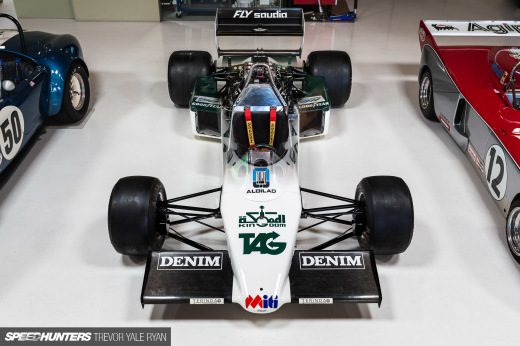 Last week, while visiting my local automobilia shop Wilkinson's, I had the opportunity to come into contact with the work on one such car collector. 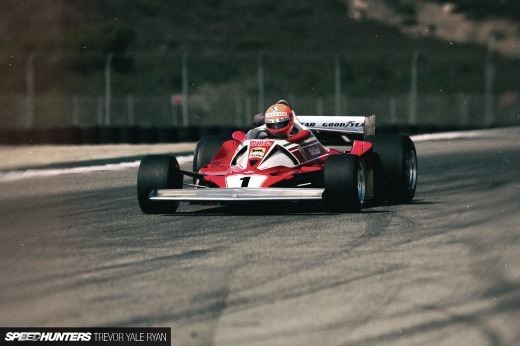 This man had previously owned a chain of Ferraris but later in life had completely devoted himself to building up a massive collection of Ferrari models and memorabilia. Unfortunately he recently passed on, and the collection has been moved to Wilkinson's by the man's estate and is currently being organized and catalogued with the aim of selling everything off. 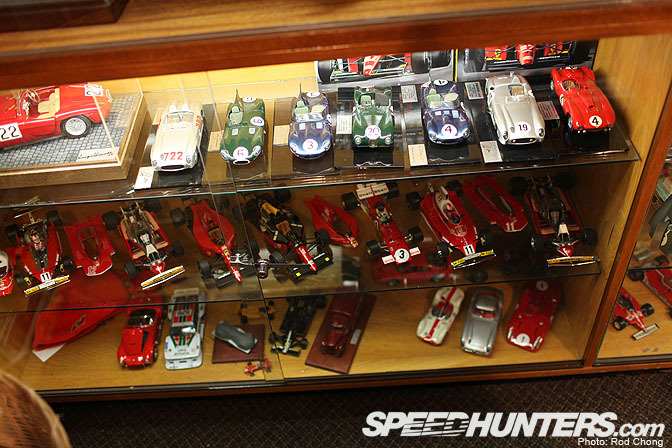 A large portion of the collection is comprised of rare, handmade Ferrari models. 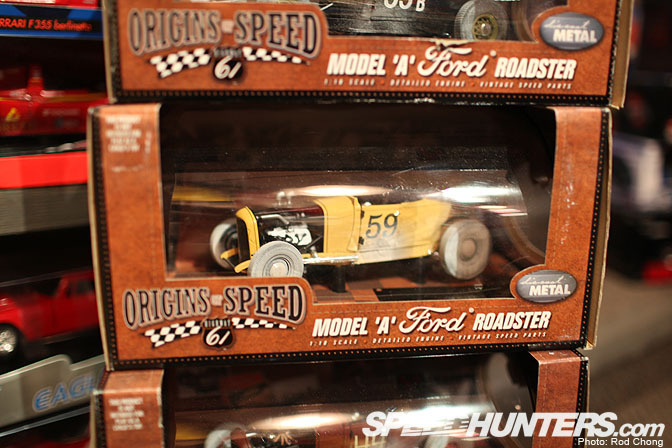 While I collect mass produced die casts myself, these miniatures are a whole different ball-game. 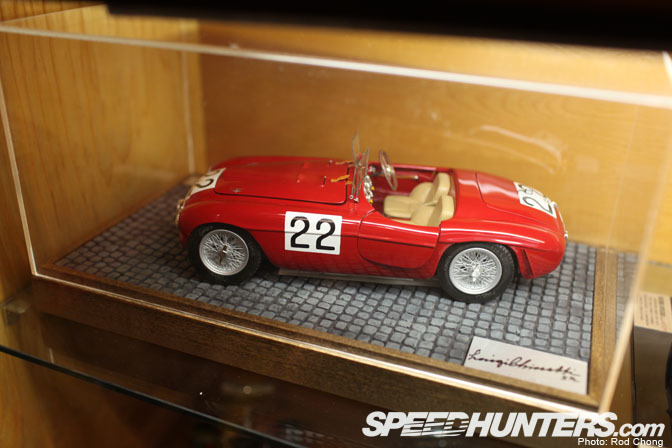 Some of these 1/43 models are worth as much as $5000 dollars! Imagine that! And if you consider there are several cabinets and countless boxes filled with these limited run items, you start to get a sense of the scope of the collection. This 166MM was the first Ferrari to ever win Le Mans and was driven for 23 of the 24 hours by Luigi Chinetti, who later went on to become the first ever Ferrari Dealer in the US. You'll notice he has hand signed the model display. 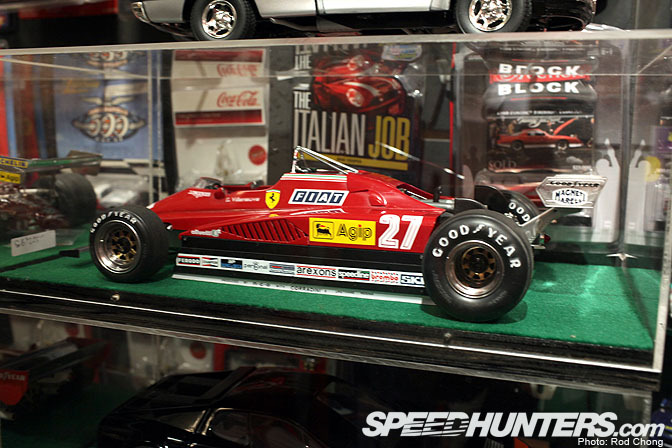 Other hand-made wonders include several hand made large scale Ferrari F1 cars. 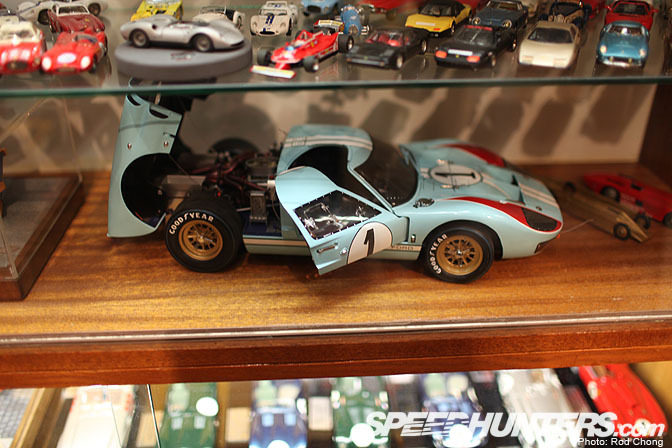 There are other non-Ferrari items in the collection too like this large scale Ford GT40. I just about fell over when I saw this stack of Le Mans annuals and put a reservation on the 1979 and 1981 editions. BTW, the 1978 book you see here is the first year the annual was published and will likely be snapped up pretty quickly. 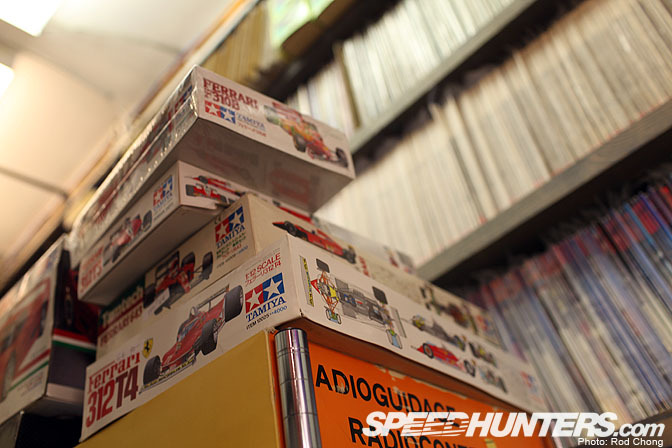 The collection also includes all sorts of Ferrari based toys from across the decades. Ted Wilkinson also opened for me, a random sample of the many boxes of Ferrari memorabilia currently filling up every corner of the shop. 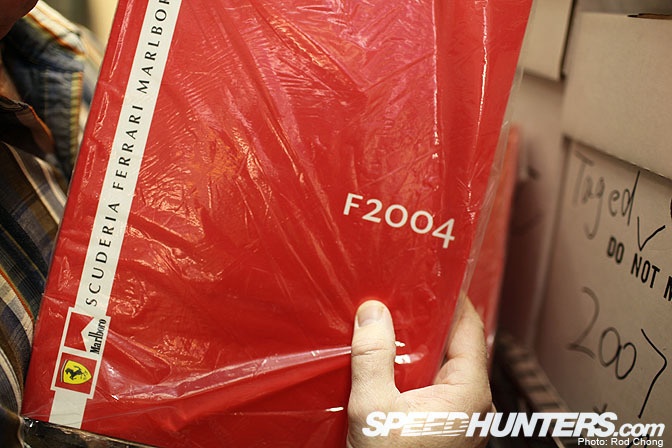 A quick browse netted this F1 press kit from the 2004 racing season, all wrapped up and in perfect condition. 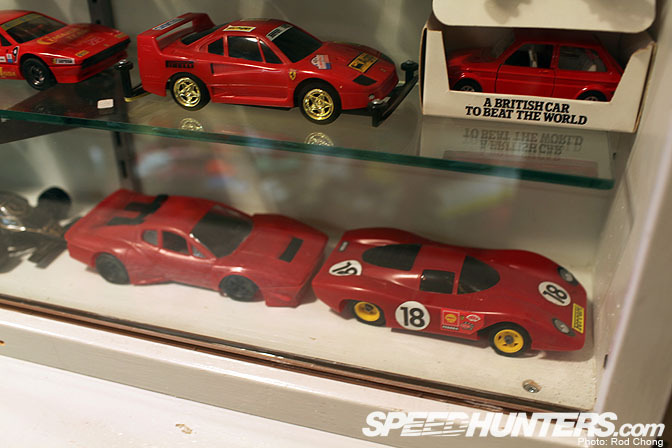 Every conceivable Ferrari plastic model kit is part of the collection. I just hope that no one buys these as xmas presents for some young kit to glue together! 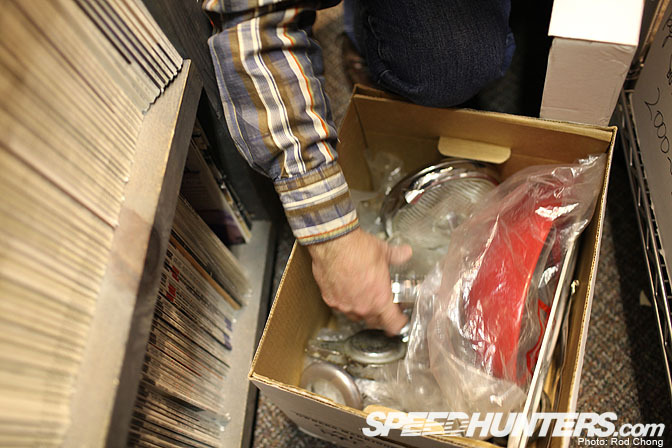 Wilkenson's is also now in possession of boxes upon boxes of rare Ferrari parts. A rummage through a random box netted this 1950s OEM Ferrari gauge… IMO it's a bit of a shame that the Ferrari collection is being broken up and sold off by the deceased man's estate, but there's not much that can be done about that… Not unless a Ferrari enthusiast with some very deep pockets swoops in and buys up the entire collection! I supposed stranger things have happened. I also had quick look around the shop to see what else was new and happening for the end-of-year-consumer-frenzy. 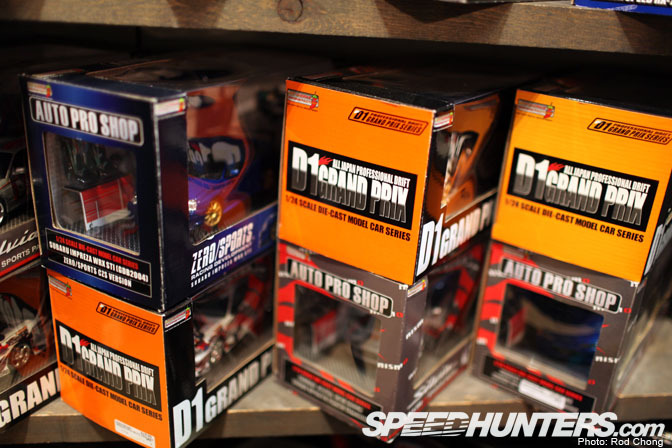 Wilkinson's has recently come into possession of a stack of Hotworks D1GP models. 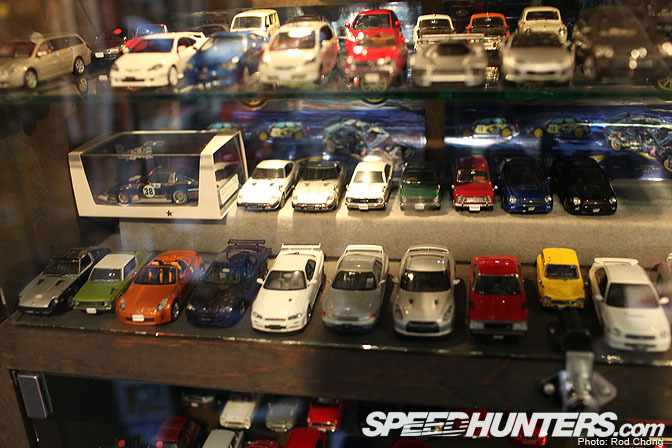 They have complete sets of both 1/24 and 1/64 Japanese drift car models. 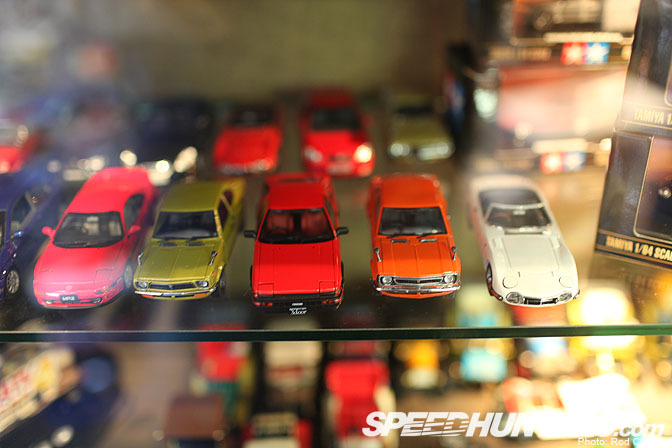 … I also had to take a moment to gaze longingly at the Autoart Super Silhouette Skyline along with its BRE 240Z friend. Wilkinson's also have in stock an orange Jagermeister Kremer K3…. ahh the pain!!! The longtail Mooncraft RX7 would be my choice of this group, except I already own the model! Any closet auto culture historians among, you will find this new book interesting. 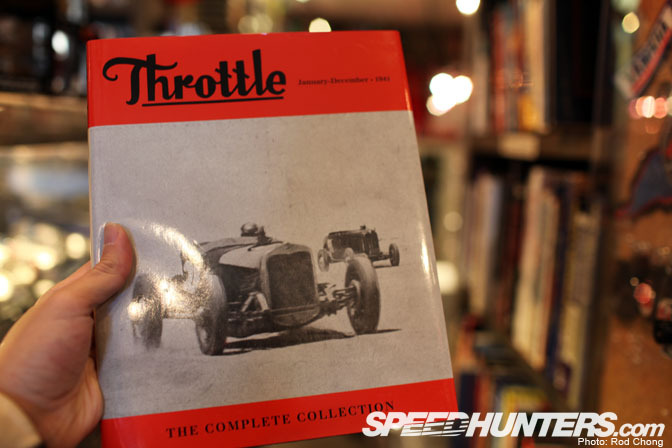 Published by The Rodder's Journal, it's a complete reprint of all 12 issues of the world's first ever Hot Rod magazine, Throttle. This magazine was published for 12 issues only, during 1941… many years before the foundation of Hot Rod Magazine in the late 1940s. The issues are extremely rare and hard to find. 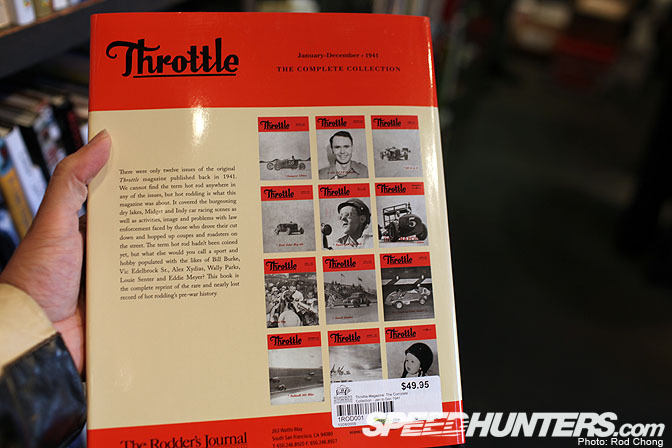 But the good people at The Rodder's Journal have managed to track down and expertly reproduce every single issue of Throttle into one complete archive book. I find the ads interesting to look at, as it's a time capsule snapshot of the first aftermarket companies taking form. 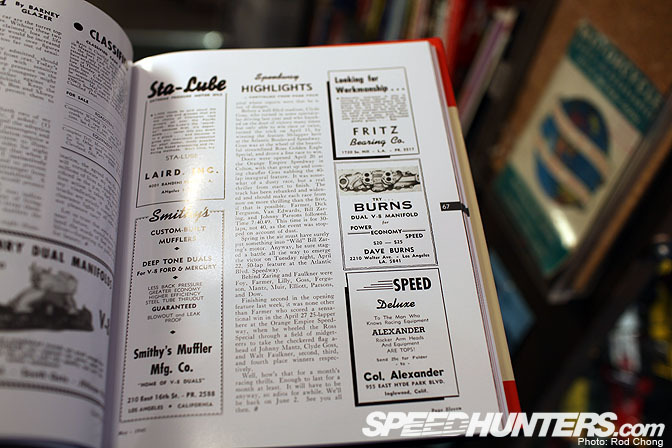 The term "Hot Rod" isn't even in use in this amazing archive, nor has drag racing officially been invented either. OK time to look at some Photos of the Year talk soon! I so miss Wilkinsons...would drive up every few months when I lived in Seattle... Great post, thanks! I hate going to stores like that because no matter what I get I always walk out of there thinking, "Damnit! I'll have to get that _____ next time." I want it all,beautiful collection.Really amazing. Wow... I would love to spend some time wandering round looking at all these models and then killing my credit card! Does anybody know of somewhere like this in the UK? It's a terrible shame that after one person has spent so much time and effort (and money) to build up a collection, it will ultimately wind up being sold off bit by bit. Or am I just being too sentimental? 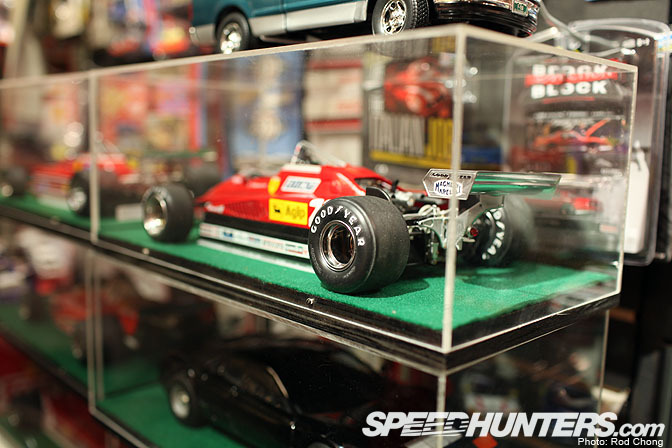 Something like a paradise for automotive collectors! Im going to go look for that book..... hmm... does borders have it? I've been there many times. It's impossible to leave empty handed.